First Line: They tell me it was an IED hidden in a truck full of goats going to market, pulled off to the side of the road with an apparent flat tire. Until an improvised explosive device ripped into her vehicle, Hannah Manning was an internationally-renowned journalist and war correspondent. Now suffering from TBI (traumatic brain injury), Hannah's staying with her sister and her family on a small vegetable farm in Prince Edward County, Ontario, Canada. She's been told that her type of injury can take a long time to heal, but she never dreamed that time would drag so slowly. The tiniest thing can set off a horrendous headache. Once a voracious reader, she can no longer read the printed word. Her brother-in-law doesn't understand the nature of her injury and wishes she would leave-- the sooner the better. The only ways Hannah has found to pass the time is by fixing lunch for everyone, going for walks with Hila, an Afghan refugee staying on a neighboring farm, and going on the occasional horseback ride with her ten-year-old niece Lily. When Hannah is told that they're living in the original farmhouse her brother-in-law's ancestors built in the 1780s and that there are trunks filled with letters and other documents in the attic, she perks up a bit. Although she can't read the printed word, she can read handwriting... just one of the quirks of TBI. Sleepless most nights, Hannah goes up into the attic to read those letters and becomes interested in the life of Maggie Macgregor, a woman whose life was destroyed by the Revolutionary War. Hannah also begins to have visions of a woman whenever she has to go down into the root cellar. Are these visions a result of TBI... or are they real? (And which would be worse?) Then Hila disappears, and when Hannah cannot account for her time, old enemies begin to circle. Author Vicki Delany has written an absorbing tale of suspense centered on an old Canadian farmhouse built by people loyal to England who were forced to leave the United States during the Revolutionary War. Maggie Macgregor is a woman in the past who is dependent upon others for her survival. Hannah Manning is an independent woman in the present who is afraid that she will be dependent upon others for the rest of her life. These parallel stories twine about each other and give each character a chance to shine-- and shine they do. Hannah is a very well-defined, believable character; however, this tale isn't merely a character study. More Than Sorrow has a lot to say about people's reactions to refugees (and how it feels to be one), how long-buried secrets will always find a way to haunt those in the present, and it also sheds light on a little-known chapter in American Revolutionary War history. When I finally closed the cover on this book, I was thoroughly entertained, enlightened, and wishing that I knew what was in store for Hannah Manning in the years to come. 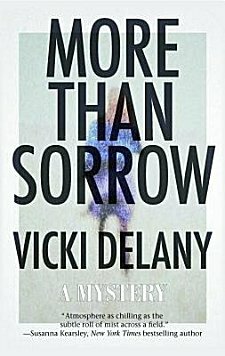 Vicki Delany is the author of two excellent mystery series, but if I were you, I wouldn't ignore her standalone novels-- like More Than Sorrow. Cathy - Oh, wow, this one gets my attention. I already really like Delany's Constable Molly Smith novels, and this one sounds intriguing on a lot of levels. Just love that mix of past and present, and the atmosphere sounds great too. Yeah, this one goes on the list. I really liked the first Molly Smith; the second, not so much. But I'm willing to give Delaney another try and this sounds like a good book to do it with. Reminds me a bit of a YA novel called The Root Cellar by Janet Lunn. Also set in eastern Ontario and ties the modern with the Civil War. It's one of my (& my daughter's) favourite books! Now I'll be tracking down The Root Cellar. Thanks for mentioning it, Debbie! You're welcome, Dorothy. Enjoy the book!